Injecting fall colors into the landscape is about more than just planting red maples and other trees that display colorful leaves. Do not forget shrubs and vines. 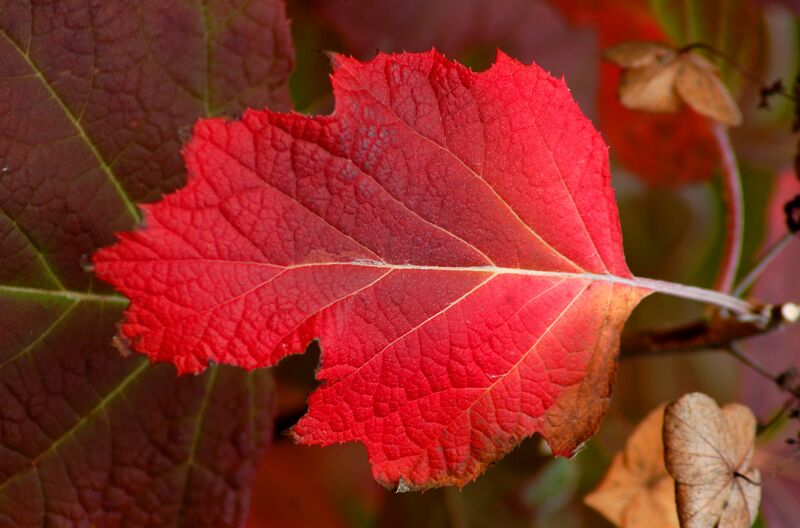 There are many shrubs and vines that are great for fall color. Some bear pretty berries, some have colorful leaves, and some exhibit both. The best examples not only have a brilliant autumn display, they also add value at other times of the year. Oakleaf hydrangea is so named because its leaves are shaped something like those of oak trees. These bushes produce white flowers in summer that fade to a pinkish-brown in fall. But oakleaf hydrangea is most sought after for its foliage, which turns reddish, bronzy-orange, or purplish in the fall. The shrub grows to a height of 4 to 6 feet, with a similar spread. Oakleaf hydrangea is a great choice for creating four-season interest in your landscape because its branches sport an attractively peeling bark in winter. It will tolerate a bit of shade, but for optimal coloration, grow it in full sun. Sumac bushes may not be the first thing that comes to mind for providing fall colors in the landscape. In fact, they are more likely to be considered a weed. This is probably due to the fact that once a plant is identified as sumac, homeowners often jump to the conclusion that the plant is "poison sumac." In reality, poison sumac would hardly ever be found in a front yard, unless your front yard is a swamp—poison sumac's natural habitat. The easiest way to distinguish poison sumac from the non-poisonous type is by comparing their berries (non-poisonous sumac berries are deep red colored, poison sumac berries are green or white). The colorful leaves of the many types of non-poison sumac provide fall colors ranging from reddish or maroon to golden. Two such varieties are staghorn and smooth sumac. The widespread staghorn sumac (Rhus typhina) is a relatively tall variety (reaching 18 to 35 feet). Smooth sumac (Rhus glabra) is another common type. This bush can grow to 10 feet tall at maturity. Tiger Eyes is a cultivar with golden leaves. Dwarf fothergilla (Fothergilla major "Mt. Airy") is a spherical, multi-stemmed shrub with white flowers in spring that carries a fragrant aroma. In fall, the dark green foliage of summer changes to colors of yellow, orange, and scarlet. Reaching 6 to 10 feet high, the shrub spreads 5 to 9 feet. Fothergilla should be planted in a sunny or partially sunny location; the more sunlight it receives, the more likely it will put on a good display in autumn. Hamamelis x intermedia "Arnold Promise" is one of those wonderful shrubs that blooms in early spring. It is often the very first plant to bloom. If given sufficient sunlight, it can also display magnificent fall foliage colors of yellow, orange, and red. Its contribution to landscape color in the spring and fall make up for the fact that it offers little display value in summer and winter. It is difficult to match oakleaf hydrangea for year-round interest, but Gold Mound spirea comes close, offering three-season interest with spring foliage, summer flowers, and fall color. In addition to the golden fall color that gives this shrub its name, splashes of light red find their way onto the leaves in autumn. But if you really want red, grow the shrub, Spiraea betulifolia "Tor." It reaches a height and spread of 2 to 3 feet and has dark green leaves in summer that turn to red in fall. In May, the plant bears small, white flowers in clusters. Both Gold Mound and Tor spirea perform best with full sunlight. Based on colorful leaves alone, burning bush shrubs (Euonymus alatus) would qualify as a great fall-color plant, but unfortunately, these fall-color standouts are invasive plants. As an alternative, consider Virginia sweetspire. Virginia sweetspire will spread, but it is not considered invasive in North America. It forms colonies via root-suckering. So if you like the appearance of this plant, you are in luck. You may end up with more of it than you started out with. The bush also flowers in spring, but, compared to the exquisite fall color, the blooms are not noteworthy. A number of the viburnums can furnish your yard with good fall color, given proper growing conditions. Korean spice viburnum is one of them. Some would say that the bush offers even more in spring, when it produces clusters of extremely fragrant flowers. For this reason, you should plant it in a sunny spot, preferably near a window, porch, patio, or deck, where you will be able to fully appreciate that fantastic aroma. Blackhaw viburnum (Viburnum prunifolium) yields white flowers in May, which become an edible fruit at harvest time. Fall color is offered not only by these bluish-black berries but also by colorful leaves (especially if grown in bright sunshine). Dark green foliage morphs to purple to reddish-bronze to crimson in fall. It achieves a height of 12 to 15 feet and a spread of 812 feet. Arrowwood viburnum bears white flowers in spring, and in autumn it gives you a 2-for-1: nice fall foliage and blue berries. When mature, these shrubs can range anywhere from 6 to 15 feet tall. This bush gets its descriptive name from the hard and straight stems that emerge from the plant's base that were traditionally used to make arrow shafts. Virginia creeper is commonly mistaken for poison ivy. The range of its fall color can be pretty wide (anywhere from a reddish-purple to a reddish orange). It is a gorgeous plant in autumn, but it can also be a nuisance due to its aggressive growth. The showiest coloration for this vine is achieved when it is planted in full sunlight. Boston ivy is a close relative of Virginia creeper, both vines belonging to the genus Parthenocissus. It is a toss-up as to which offers a better autumn display, although Boston ivy is the better known of the two. Beautyberry is a novelty plant, thanks to the purple berries it bears in autumn. It does not afford much landscape value at other times of the year, but the purple berries alone (not to mention their interesting growth pattern) are enough to woo many a gardener. Another group of shrubs worth considering for fall berry color is the chokeberries. Red chokeberry (Aronia arbutifolia) reaches a height of 6 to 10 feet and a spread of 3 to 5 feet. This shrub has white flowers in early spring that become glossy red berries in the summer. In autumn, the berry color can turn deeper, almost to purple, providing interesting fall color. Viking black chokeberry (Aronia melanocarpa "Viking") bears white flowers in May with dark green foliage. The foliage morphs first to red, then to purple in the fall. The berries produced by this shrub grow in clusters and are a blackish-purple. Although not edible for humans, the bitter-tasting berries remain on the shrub well into the winter and serve as an emergency food source for birds. American bittersweet is a vine native to North America. Do not confuse this with Oriental bittersweet (Celastrus orbiculatus), which is attractive, to be sure, but terribly invasive when removed from its homeland. For those shopping in North America, make sure you go to a reputable nursery where you can trust that what you are buying is truly American bittersweet. American bittersweet is a good choice for those serious about providing the landscape with fall color. The berries, green in summer, bear a yellow husk in early fall. Even at this stage, they provide a truly striking display of fall color. But this initial treat is merely a preview of the splendor to come. As autumn progresses, the husk peels back, revealing an orange berry within. And as if that were not enough, the numerous leaves of the vine turn a vivid yellow. What Trees Have Opposite Branching?